No B-TAG? No Worries! Buy one here. Everyone needs their own B-TAG to ski or snowboard at Mt Buller! It stores your lift passes, which opens the gates at the chair lifts, as well as links you to any online rental or lesson orders you may have booked. If you have purchased a B-TAG in-resort at Mt Buller already, either register it here, or if its already registered, select a link on the left to buy lift tickets. If you have lost your B-TAG, buy a replacement one below. Pick-up Locations: Any ticketing window/office, any Buller Sports store, Chalet Boutique, or the Ski and Snowboard School. Keep this one on your upper body, in a pocket by itself, loaded with a lift pass while riding the chair lifts. 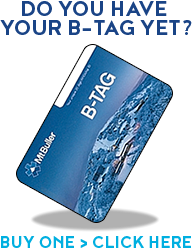 Once you purchase your B-TAG online, any further online Lift Pass purchases will be useable with that B-TAG. Photo ID with date of birth required for pickup. The product you have selected requires that you select a location and date. If the requested day is not available, you can choose another date. Snow Squad enrollments may have reached their capacity. Please note the initial purchase of the $5 B-TAG is the RFID card and does not contain any Lift Access products. If you add a B-TAG to your shopping cart, you can also add Lift and Lift & Lesson products into the same transaction. Be sure to attach the correct guest to the products being purchased! Once you have purchased your B-TAG and/or Lift Access products you will receive a confirmation email as your proof of purchase. You will need to show this confirmation at any Ticketing or Buller Sports outlet along with some photo ID to collect your B-TAG. Just follow the red carpet to the Online Sales Express lanes in store! All guests must be able to produce photo ID and the credit card used to purchase their products to collect. If unable to produce either, pre-purchased products will be withheld, and additional products will need to be purchased on the day. Sightseeing tickets are not available from this website.